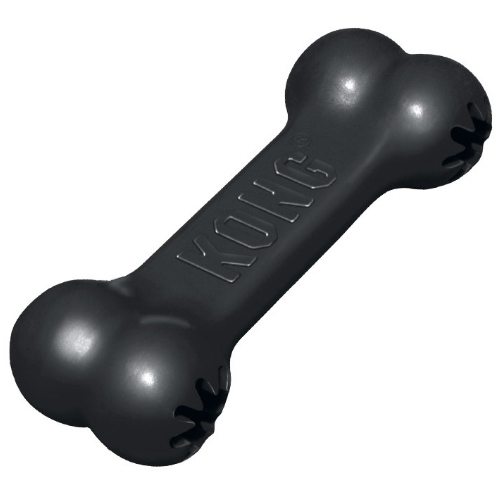 The KONG Extreme Goodie Bone is a bone for dogs who love to chew and play. The Goodie Bone is made from extra strong rubber, so that it can stand even the most enthusiastic chewers. This toy is made even more attractive for your dog when you fill the ends with a delicious treat. The Extreme Goodie Bone is suitable for extreme chewers because of the strong rubber. There is no guarantee that the black KONG will not break, but it will most likely last longer than any other toy. The bone is made from natural materials and is hence not harmful to your dog's health. Do you want even more fun for your dog? Fill the ends with his favourite snack! This will not only give the toy an extra challenge, it is also good for you dog's training. Have you used KONG Extreme Goodie Bone before? Let us know what you think about this product.